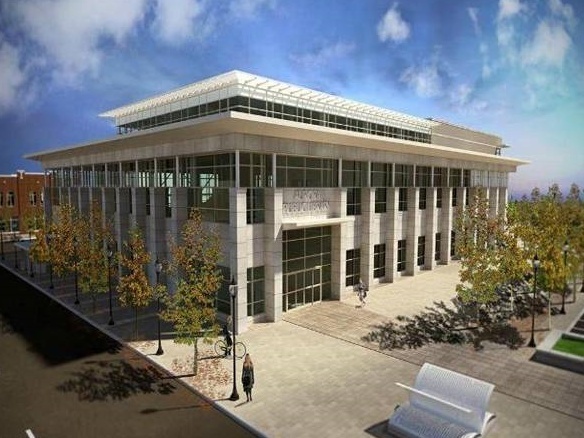 The City of Aurora will construct a new LEED-certified 97,000-square-foot Main Library as part of its commitment to improving the City and its infrastructure. The downtown Library, which serves more than 500,000 patrons each year, has exhausted its current building. To reposition it for the new millennium, the new Main Library will feature state-of-the-art materials handling technology, expanded space for children and youth, meeting rooms, and quiet study rooms, as well as space for cultural events such as art, humanities, performances and historical exhibits. As a LEED-certified building, it will reduce waste, conserve energy and water, reduce harmful emissions, and lower operating costs. The new library parallels other improvements to downtown Aurora's infrastructure, such as the new River's Edge Park and Waubonsee Community College's downtown Campus expansion. The Aurora Public Library Board of Directors and Administration have been planning for a new downtown library for more than 10 years. The current Carnegie library building was constructed in 1904 and underwent major remodeling project in 1942 and received a new addition in 1969. It has extensive structural and technological issues. After more than 100 years, Aurora is in need of a new flexible library design to accommodate ongoing technological advances as well as the growing population of the State's second largest city. The new library will remain steps away from downtown Aurora at the intersection of River and Benton streets on the former Beacon-News property. Branch locations of the Aurora Public Library will also receive significant upgrades as a result of the bond sale, with two additional service points added to underserved areas of the city.